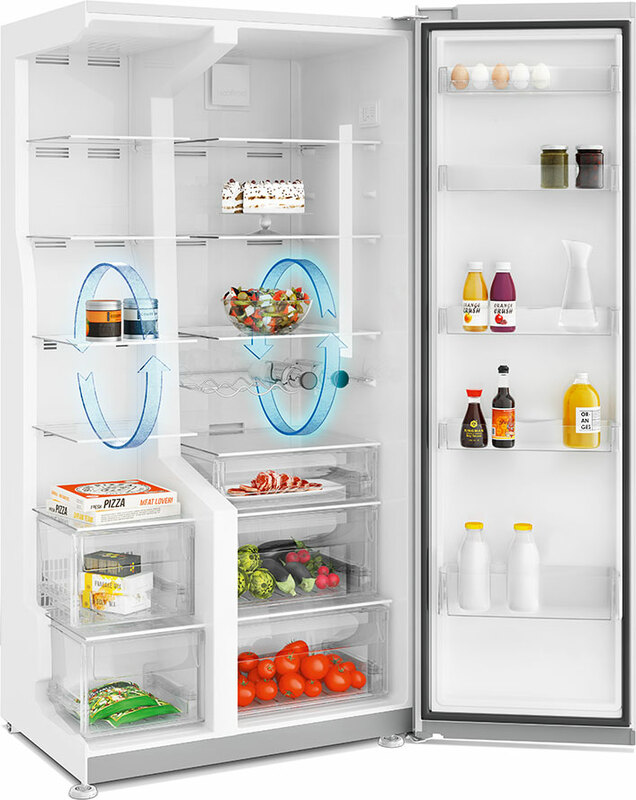 A Grundig FullFresh+ Side by Side refrigerator is the new place to be for your healthy favourites: A cons­tant temperature and high humidity level in the crisper drawer are preserved by cool air coming out of small ventilation holes. To simultaneously minimise condensation and improve airflow, the specially designed drawer top features small apertures. 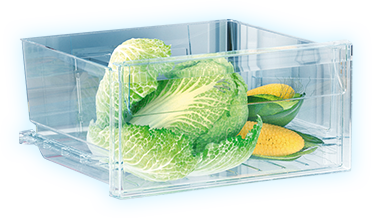 These ensure ideal conditions inside the compartment for fruit and vegetables. As your produce won’t dry out, it stays naturally delicious and farm-fresh for up to three times longer. In short, you’ll have less waste, less shopping and always a good feeling. Because you can be sure your favourite fruit and vegetables are in a safe place – patiently waiting for you to enjoy them. 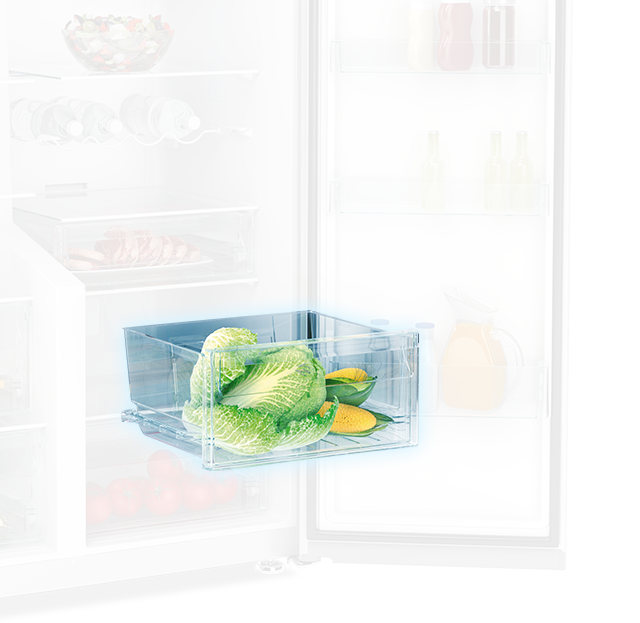 Storing fresh produce in the special VitaminCare Zone inside the Grundig Side by Side refrigerators is a bit like returning it to the field. That’s because built-in blue light technology simulates natural lighting conditions so that the amount of vitamin C in red vegetables and fruit is especially preserved. Furthermore, the overall vitamin level in your healthy food is boosted, helping to keep it fresh and the goodness locked in. Think of the VitaminCare Zone as a time machine that simply retains your food’s natural off-the-stalk freshness and appearance. You’ll see the benefits in the reduction in waste and shopping trips – not to mention the savings. Blue light technology boosts vitamin levels in your fruit and veg. To prevent unpleasant odours and bacteria, Grundig relies on tiny helpers called ions. IonFresh Tech-nology produces these naturally occurring particles, which can be found in high concentrations near waterfalls or in forests. Often referred to as the “vitamins of the air”, they destroy bacteria and odour molecules before being expelled when the refrigerator defrosts. 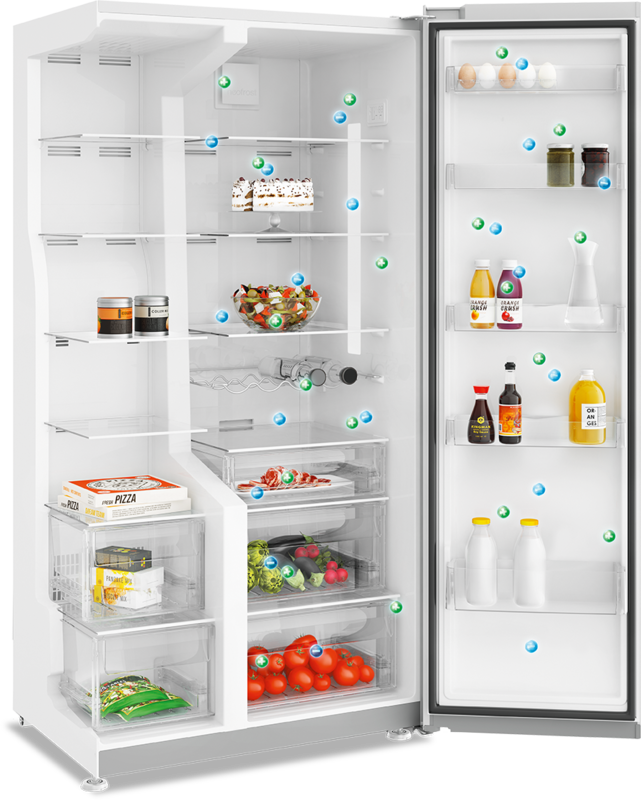 As a result, you can breathe easy whenever you open the fridge, knowing the air is clean and your food will stay fresh for longer. Negative ions are capturing positive ones. 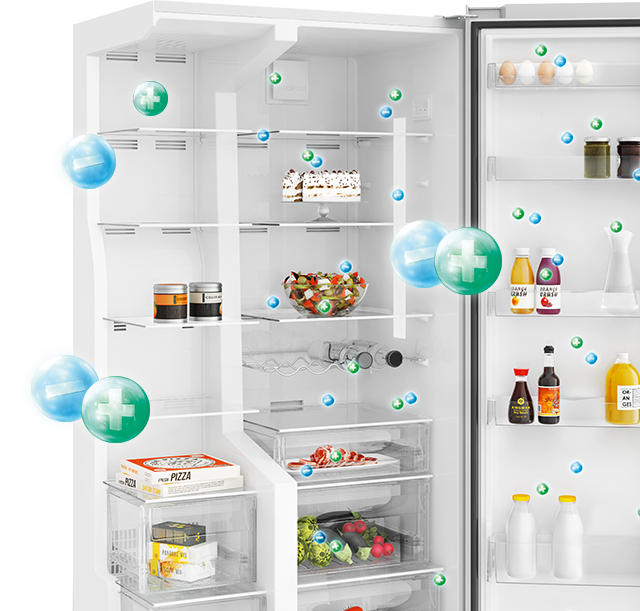 This manages to reliably clean the air in the fridge from odours and bacteria. The new variable-speed Inverter EcoCompressor inside the Grundig Side by Side models helps to lower energy consumption by up to 25%* while also keeping noise levels down. Even so, it’s quite the cold storage powerhouse. 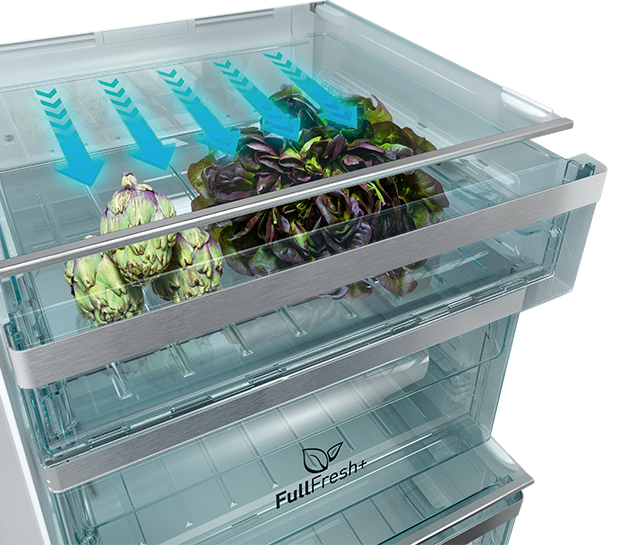 High compressor speeds make for quick freezing and improved temperature stability ensures that food keeps fresh for longer. 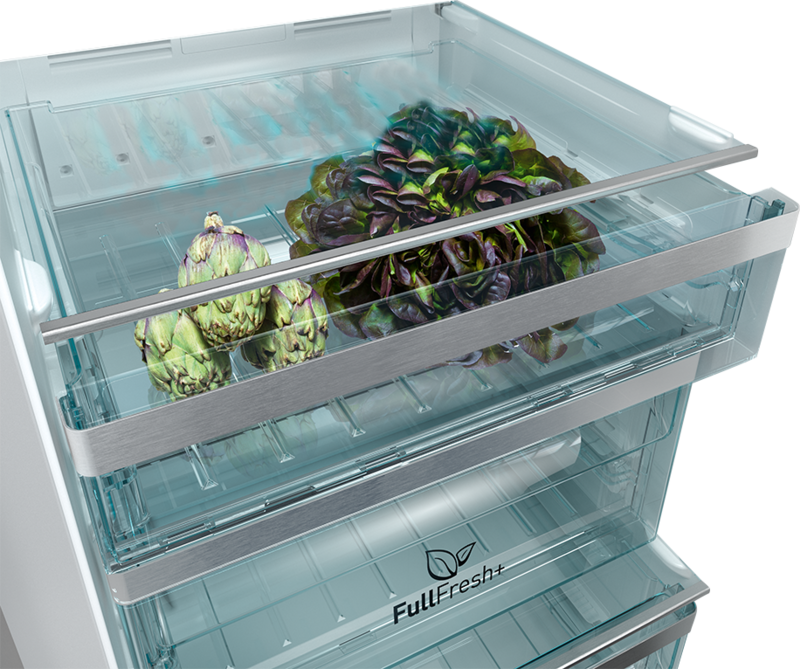 When paired with our Duo-Cooling No Frost Technology, increased humidity levels in the fridge prevent food from drying out and prolong its life. What’s more, the frost-free function reliably stops that icy crust from forming, so you don’t have to defrost any more. Apart from saving you a lot of work, this fridge also saves on energy costs. 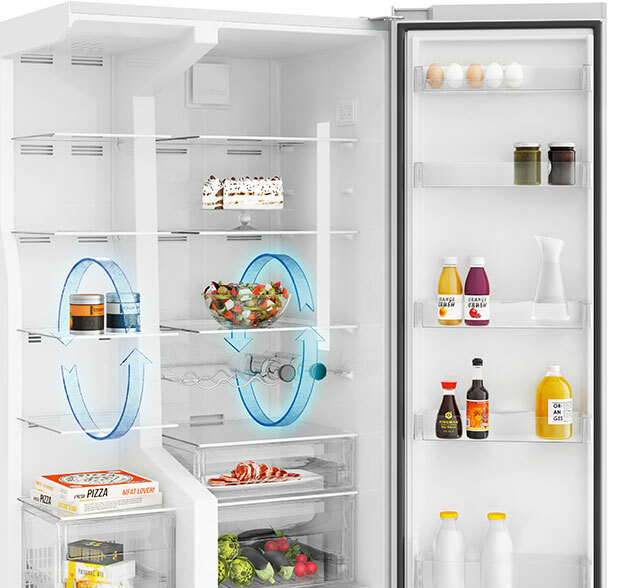 Specially designed sound-insulating components together with flow-noise regulators help keep the fridge whisper quiet even as it cools down. 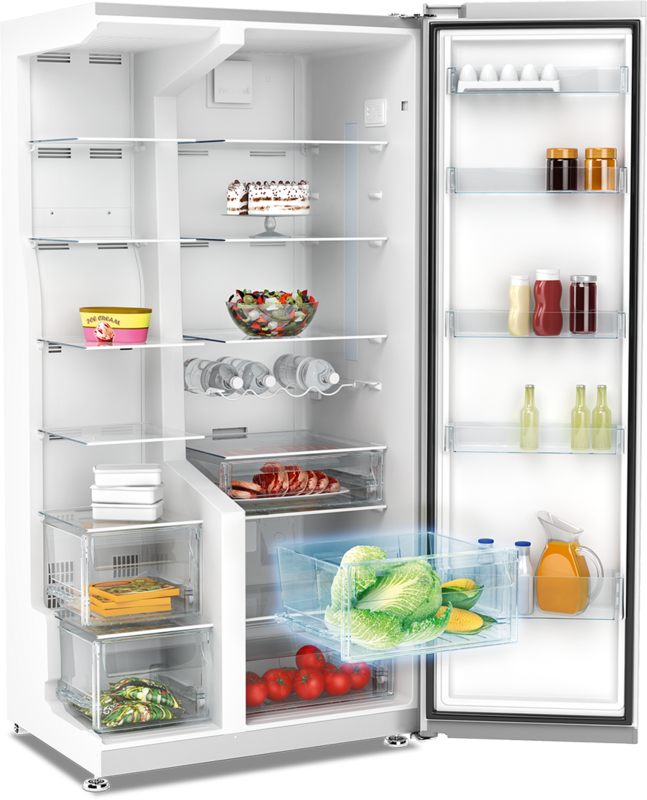 White LED lights provide more attractive fridge lighting that is also cleaner and more efficient.